In 2-quart saucepan, heat vegetable oil over medium heat. Cook serrano chile and garlic in oil 2 to 3 minutes or until softened and fragrant. Add quinoa and taco seasoning mix; cook 1 minute, stirring constantly. Stir in broth; heat to simmering. Cover; reduce heat to medium-low, and cook 18 to 20 minutes or until liquid has been absorbed. Transfer to serving bowl; stir in beans, and let stand at room temperature 15 minutes. If making ahead, cover and refrigerate overnight. Meanwhile, in small bowl, beat lime juice, honey and salt with whisk. Slowly beat in olive oil; reserve to use as dressing. 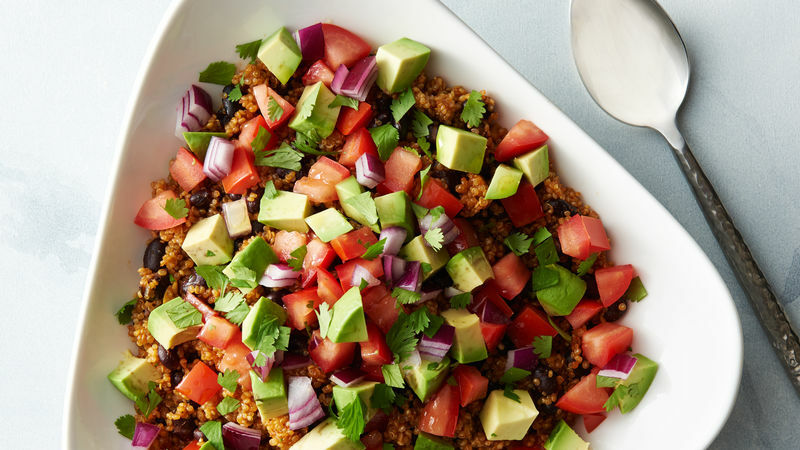 Top quinoa mixture with tomato, avocado and red onion. Drizzle with dressing; sprinkle with cilantro. Quinoa is a very easy grain to prepare. Rinsing the quinoa is important to remove a natural powder coating that can have an aftertaste. This recipe uses less liquid than most package instructions but yields a lighter texture. Quinoa and dressing can be prepared ahead and finished with fresh elements just before serving. Serrano chiles are two to three inches long; they are fresh green chiles that are smaller in diameter than jalapeños. Although serrano chiles are spicier than jalapeños, they offer a consistent spice level, making them a great choice for recipes.